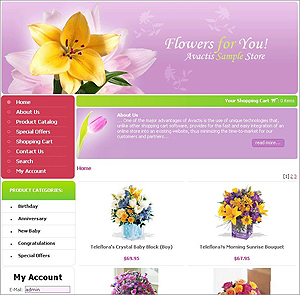 Avactis Shopping Cart is a software package that allows you to open an online store on the Internet. Compared to other similar software, Avactis offers a unique advantage of very simple integration of the online store into your existing site. For many similar systems, integration of an online store is a big problem that requires a lot of time and effort. We eliminated this labor-intensive task by using special tags. As a result we can offer our customers a very convenient tool for the quick launch of an online business. An electronic store comprises two parts - a client side (the storefront) and an administrator side. The client side (the storefront) is your website as seen by visitors. The Avactis's client side allows the visitors to your site to browse products in the online store, select products and put them into the shopping cart, as in a conventional supermarket, and then pay for the selected products using a credit card or other payment options. The Avactis's administrator side allows you to stock up the store with products, as a conventional warehouse, maintain the inventory, track orders and payments.